Makeup brushes are the worst. So. Much. Work. Earlier this year I was diagnosed with a skin condition called melasma and an eye disorder called ocular rosacea. What this amounts to is having brown patches of skin, and red bloodshot eyes. It’s fair to say that 2015 has not been a great year for my face. The melasma has meant I’ve had to coat myself in serums and sunscreen everyday, leading to vampirically pale skin. The rosacea has also meant I’ve had to stop wearing makeup altogether. Of course I can still wear lipstick, but not if I want to kiss my girlfriend often, which I do (this is another femme dilemma for another time). I’ve gone from someone who used to wear smokey eyes at breakfast, to a blankly pale-faced person. The whole thing has been quite unsettling. But it’s also taught me a few lessons about my relationship to beauty practices. 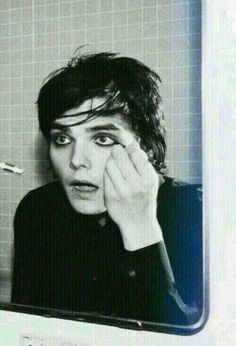 On an ordinary day, I used to love wearing lashings of mascara, glittery eye shadow and My-Chemical-Romance-levels of eyeliner. Yet I remember that I used to feel so uncomfortable not wearing makeup, that even if I was at home sick I’d get up and put foundation on. I’d also start every morning so mad at the ridiculously long time it would take to put on every beauty product. I would sit at parties and look at the people who weren’t wearing makeup and think “I wish I could do that!” as if showing my un-makeup-ed face was not even an option. When I was confronted with the new necessarily-pale-faced situation, it was quite a shock. But far from being a relief, I felt more beholden than ever – this time to creams, eyedrops and tablets used to treat my conditions – and worse, without the pleasures that makeup used to bring. With my newly neutral face, I barely recognised myself in the mirror. It seemed like different eyes were staring back at me. 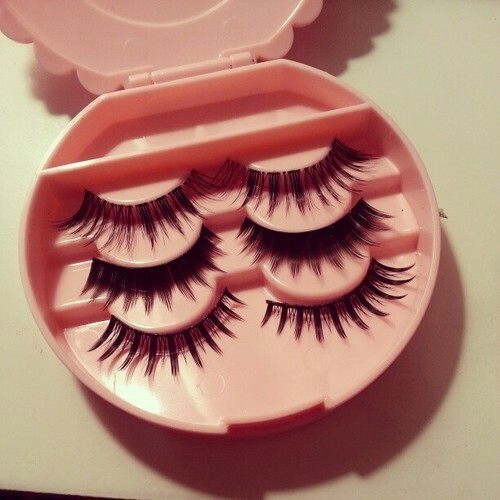 Not wanting to brave the world, I was reminded of this quote from Germaine Greer: “The women who dare not go outside without their fake eyelashes are in serious psychic trouble”. I braced myself, and for the next four months went with my new look. People started to comment on how good my skin looked, how bright, how clear. I looked more sophisticated without makeup, they said. Little did they know I was still wearing multiple layers of various serums, and that any skin brightness had been achieved through months of fierce chemical creams. I was still caught up in the desire to “look good”, just now without any of the fun. After all, my “natural” make-up free look wasn’t without a great deal of effort. Search for “natural beauty” and I’ll bet you won’t find pictures of someone with brown patches of skin and red bloodshot eyes. Recently, I decided to try full makeup again, just for a day. But looking in the mirror I was once again confused by the face that I saw. It made me realise that faces are subject to habit. If you wear the same makeup everyday, it just becomes the baseline. Because my face was always an eye makeup-ed one, the day that changed meant I had to adjust to a new face. But more importantly, a face I could never change or play around with. The whole series of events has made me think that makeup for me is neither a prison nor a completely empowering practice. There are definitely social expectations that keep me tied to the beauty machine, but there are also pleasures that beauty affords that I never new I’d miss until they were gone. My doctor now says I can wear some makeup, sometimes. 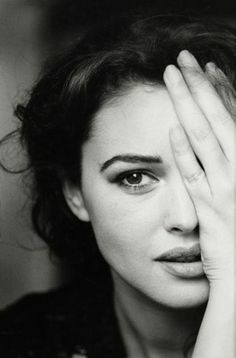 But I think I’m going to try a new face…maybe one that doesn’t fall into habits quite so easily. Today a friend sent me a link to a new trend that basically caused me to have a rage blackout: dolls that have been “made-under”. Labelled “Tree Change Dolls“, these are generally hyper-feminine styled dolls (such as Bratz) that have been found at op-shops and transformed through changing their hair, shoes, makeup styles and clothing, to look more normal and natural. In the words of their creator, Tree Change Dolls involve “swapping high-maintenance glitz ‘n’ glamour for down-to-earth style”. But before you all rush off to procure a Tree Change Doll of your own, it’s worth unpacking what it means to “make-under” a doll. 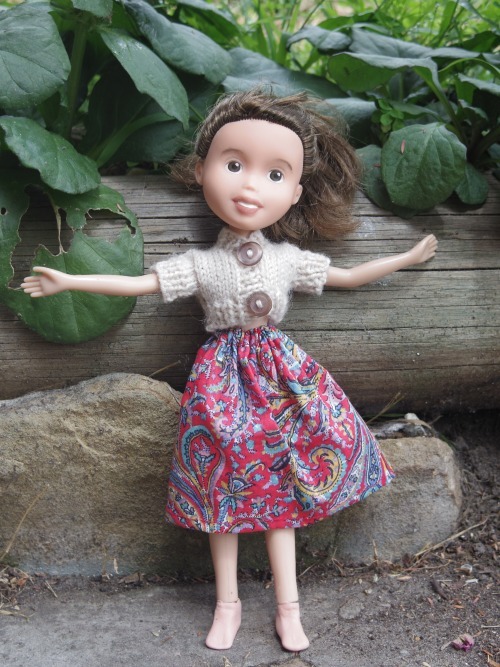 Is it more ethical (as the subtext of the Tree Change Dolls website would suggest) to have a doll adorned with the natural beauty look, rather than the hyper-feminine aesthetic more commonly seen? And why is a make-under really any different to a make-over? Here we can see that the effect of “stripping back” actually mimics a “putting on” of layers. Quite literally the features of the dolls are transformed to conform to a different standard, that of “down to earth style”. 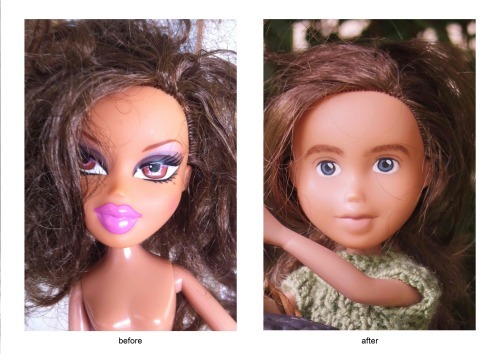 In effect, the dolls are not made-under, they are made-over, with the same dramatisation of before and after we would expect from any other visual representation of stylistic aesthetic change. Rather than radically challenging or interrupting expectations of femininity, the Tree Change Dolls set up a new system of signifiers in hyper-femininity’s place: the end result being a set of dolls that all look remarkably similar. The dolls featured on the site all have similar “natural” faces, wear knitted jumpers and 50s-style feminine skirts or alternative-style dungarees, creating an overall effect that looks like the dolls have stepped right off the pages of an alternative women’s magazine (such as Australia’s Frankie), which fetishises the domestic, the home-styled and the “real”. This styling supports a fantasy that one can retreat into a more authentic world of natural beauty, eschewing the limits of oppressive gender norms and escaping the fakery epitomized by the glamour of the pre-made-under dolls. But, I hear you ask, isn’t a “stripped-back” simple style a less problematic norm than the make-up caked faces of the pre-tree-hugged Bratz dolls and Barbies? Perhaps not. The idea that we might adopt styles of self-presentation as if in a cultural vacuum, supports the circulation of more insidious gender norms. It presents us with the idea that there is a way to look like a “real” girl: and it certainly doesn’t involve wearing visible makeup. 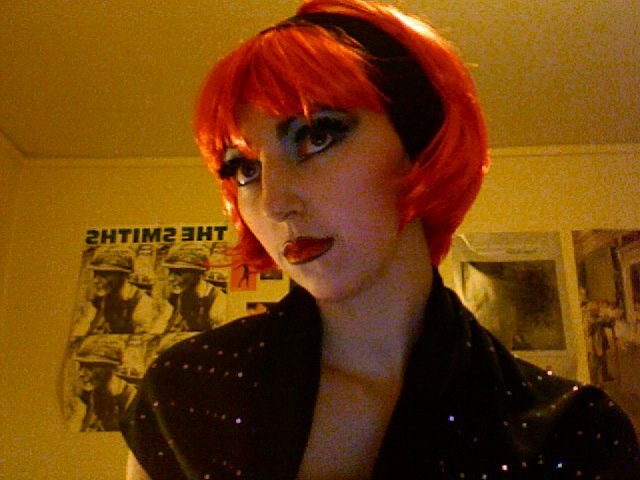 When I was a child one of my favourite party themes was “make-up”, and on three separate occasions I held parties where my friends were expected to do-over their own and other’s faces – the only thing being that it was about being crazy, drag-queenish and fun. On my eighth birthday I ended up with green sparkly leaves coming out of my nose, purple fangs and giant blue eyes. 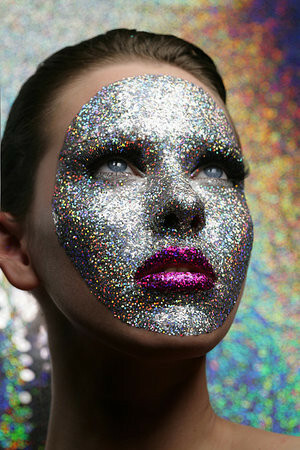 The point of this story is that make-up can be about repeating expected styles of beauty, but it can also be very fun. 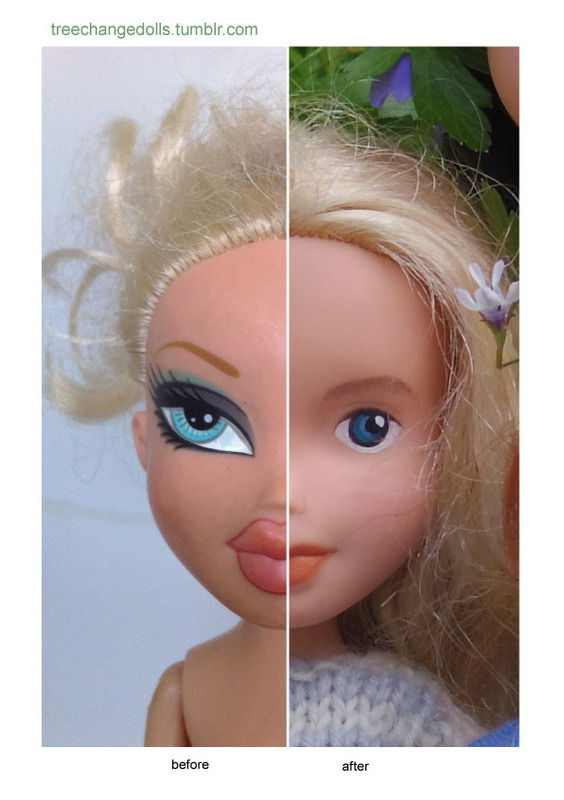 While Bratz dolls might present a beauty style that is over-the-top and homogenous across dolls, the Tree Change Dolls also opt for conformity over experimentation. As I have written previously, Bratz dolls encapsulate a sheer excess of femininity that is an indulgence rather than a necessity to attract a male gaze. Indeed, with the cult of natural beauty comes a sense that you can’t play around with beauty products or clothing if you want to – you’d just be reinforcing an always-already-oppressive style. The reason to be deeply concerned about these Tree Change Dolls is that they represent a broader trend toward securing a fixed sense of what a real girl looks like – rather than disrupting the normal when it comes to gender. In fact it seems that Bratz dolls have evolved in recent years – into the now popular “Monster High Dolls”, which, though shiny and long-haired and “pretty”, adopt quirky, strange, monstrous stylings, transforming previous limits around normal looks. While there could be a lot more diversity of styles of gender presentation in these kinds of toys, the worst thing we could do is try and offer a “stripped-back” look that returns us to some kind of original “natural” point. Sometimes the natural might actually be the most fake of all.